This fall essentials post is brought to you in partnership with Sole Society. I love collaborating with brands that I love and trust. Opinions and post ideas are my own. Happy Monday, friends! I hope you had a great weekend! Ours was nice and relaxing! It was the last restful weekend before basketball and cheer begins on Saturday mornings, so I really tried to enjoy my quiet time by the fire, with my coffee. Yes, we had a fire the past two mornings. It’s amazing how happy a fire can make someone! I just love it. Now, we just need some fall weather to go with it! Speaking of fall weather, are you getting your closet prepped and ready with Fall essentials? Today, I’m excited to bring you a few great fall basics that every closet needs. I’m excited to partner with Sole Society to chat about today’s look! They have such a great selection of all the things, but I especially love their bags and booties! I can always count on them to help me get prepped for the season ahead! 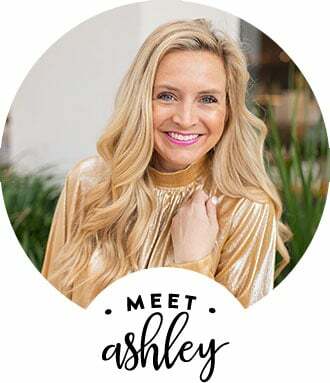 Take a peek at my favorite fall essentials and keep in mind, each of these items are so versatile and you can wear them together or separate. They are items to wear again and again throughout the next few months! Let’s chat about these Fall essentials! Everyone needs a pair of these SPANX FAUX LEATHER LEGGINGS in their closets! Whether you go with the MOTO LEGGING or the regular FAUX LEATHER LEGGINGS, you will wear these a ton this fall and winter! They pretty much go with everything! You can dress them up with booties or dress them down with sneakers. Yes, they are really that versatile! They also come in PLUS SIZES! Everyone needs at least one heeled pair of BOOTIES in their closet. THESE are so cute and come in numerous colors! I really like this MUSHROOM color as a fall basic. It will go with everything which is ideal! You will wear these again and again. I love the details on them, too! The tassel is adorable and really gives them a little something extra! These KNIT VESTS are perfection for the wardrobe! I’d suggest grabbing at least one in BEIGE, BLACK or GREY. Again, these VESTS are a great staple because they go with so many outfits. 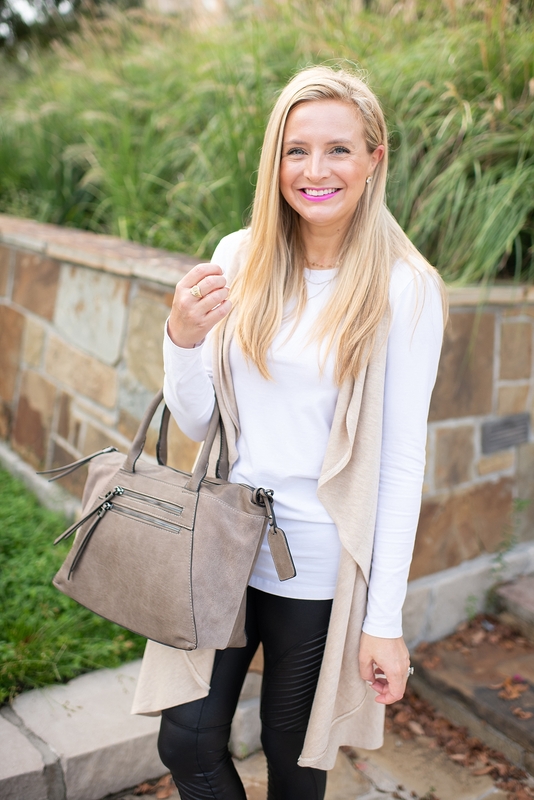 While I grabbed this VEST in BEIGE, I loved the BLACK and GREY options too! This PURSE is such a good one and I love it! 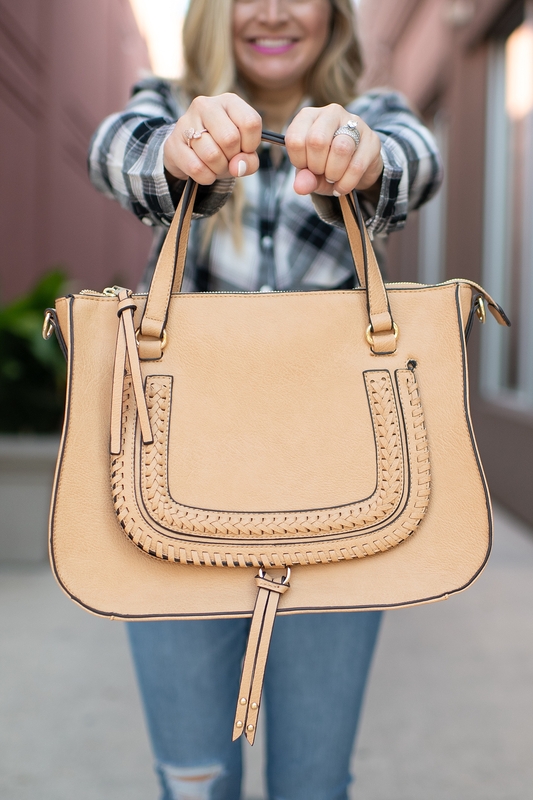 It has a crossbody strap that is optional and you know that is a must for me! It comes in a few colors, but this MUSHROOM color is again, a great fall essential because it’ll match everything! Everyone needs a good, basic white long sleeve tee! In fact, I wear them so often, under sweaters and vests, that I typically buy a few at a time. THESE are great to keep on hand during the fall and winter! Everyone needs at least one of these! I love this ONE! But, there are so many cute options out there! You will wear these with everything!! 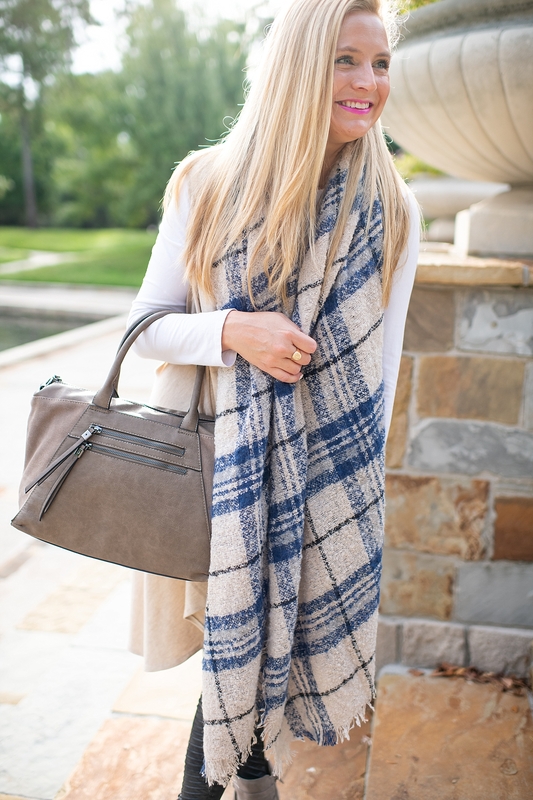 Elevate your outfit by adding a SCARF! SCARVES add texture, color, fun and warmth to pretty much any look! 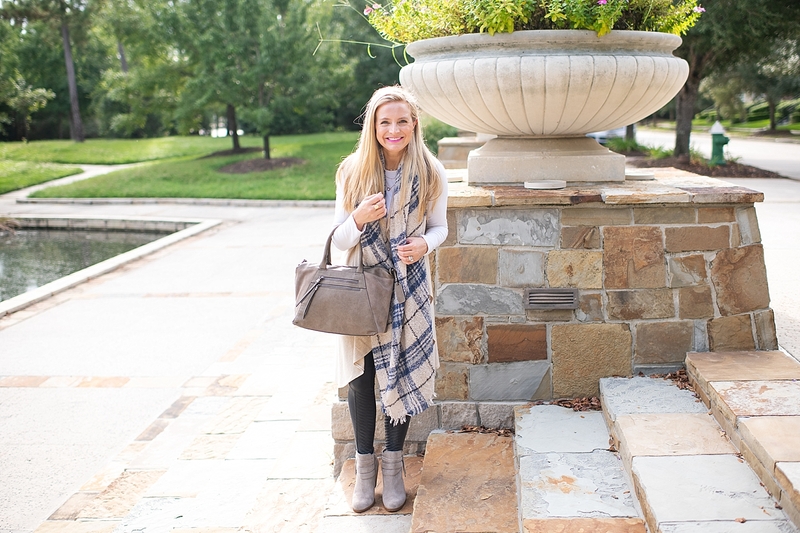 These are my favorite fall essentials! Which of these items are you adding to your fall wardrobe? PS I’m told THIS PURSE that I LOVE is coming back later today! It’s such a good one and sells out every time! Grab it HERE! It comes in so many COLORS! Loving these fall essentials? Click here now for more of my favorite fashion! I’m trying to purchase the sole society booties but I swear the mushroom color on their website looks nothing like the pair you are wearing? They are the mushroom color!